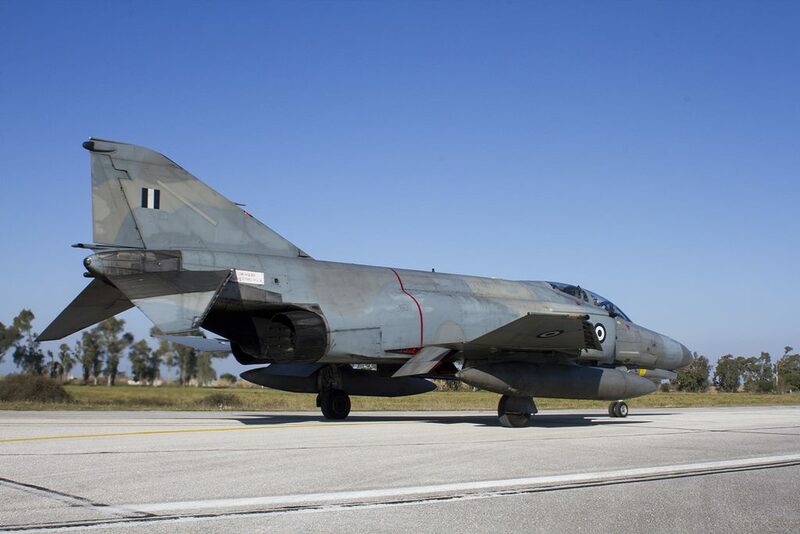 The Hellenic Air Force Phantom is one of the last "Smokers" in the sky. It maintains a respectable role in the defence of Greek territory and is still capable of fighting against modern opponents. The 117 Combat Wing at Andravida is home to the legendary McDonnell Douglas F-4 Phantom II fighters of the Hellenic Air Force (HAF). The Phantom might not be the most versatile and agile fighter in HAF service, but it remains an essential component of its Tactical Air Force planning. Today the HAF still maintains two front-line F-4E squadrons, while the aircraft is counting more than 40 years of service in Greece. The legend still lives on. 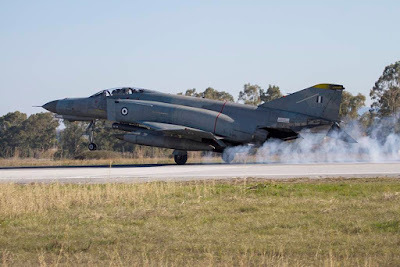 The story of the Greek Phantoms dates back to 1972, when Greece signed the contract with United States and McDonnell Douglas for the purchase of 36 F-4E Phantom IIs. The F-4E version first flown on 30 June 1967 was the most capable in the Phantom family up to then. The program was named Peace Icarus Ι. During that period of time, Greece also ordered the French Mirage F-1CG and the American A-7 Corsair II. The new home for the Greek Phantoms was to become the 117 Combat Wing based at Andravida, near to Patra city. This airfield, built in 1955, had only been used as an air detachment unit. Following this decision, Andravida was completely renovated. The ageing infrastructure was reconstructed and new hangars were built for maintenance along with modern aircraft shelters. The pilots who were selected to go the United States to receive training for the new aircraft were mostly F-84F pilots. The Republic F-84F Thunderstreak was the most numerous fighter but also the oldest type in HAF service and was being phased out. The initial squadrons destined to receive the modern F-4E were 338 and 339 which were both operating the F-84F in the strike mission. The first 36 pilots went to the United States in December of 1973, while more followed in January of 1974. All HAF pilots were trained at Homestead AFB near Miami, Florida, where the 31st TFW was based equipped with F-4C and F-4D Phantoms. The first aircraft destined for the HAF, serial number 72-1500 was first flown on 29 January 1974 from Lambert airport in St. Louis, with McDonnell Douglas test pilot E.D. Francis at the controls. The F-4E for Greece included the implementation of leading edge slats that automatically extend when the aircraft's AoA exceeds six degrees, and retract when the AoA returns to four degrees. This feature had first been introduced in mid-1972, but was it later retrofitted to all the other older F-4E versions. 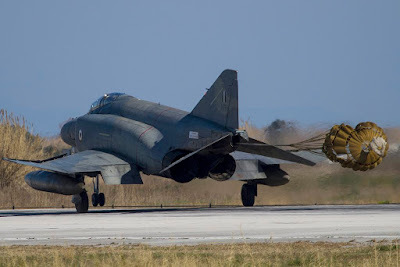 The historical moment for the Greek Phantoms came on the afternoon of April 5th, 1974, when the first six aircraft touched down on runway 34 of Andravida. 15 days later, on Saturday 20 April, the ceremony took place for the establishment of the first Phantom Squadron, 339 Squadron. Due to increased tensions with Turkey, Greek officials decided to place a second order when deliveries from the first order were completed. 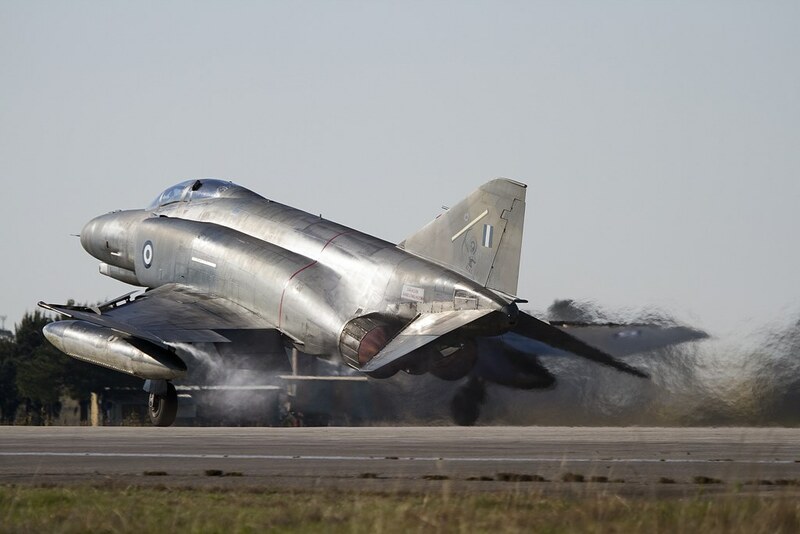 On 22 October 1976, the Greek government announced the need for additional Phantoms. Finally on 16 July 1977 the second contract was signed under the name Peace Icarus II for the purchase of 18 F-4E along with 8 RF-4E photoreconnaissance versions. 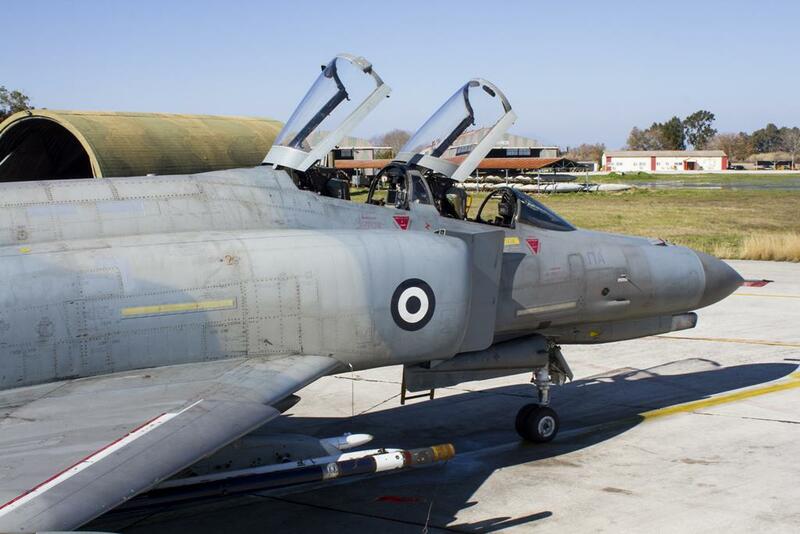 These were delivered in 1978-1979, completing the Greek Phantom fleet originally procured from the manufacturer for the HAF. The RF-4Es went to 348 Squadron “Eyes” of the 110 Combat Wing at Larissa. The Peace Icarus II batch of F-4E fighters enabled the establishment of a third Phantom unit, 337 Squadron ‘Ghost’ also based at Larissa. This squadron assumed primary responsibility for the defence of the central and northern Aegean Sea. The serials of the F-4E aircraft from Peace Icarus I were 72-1500 to 72-1535. The Peace Icarus II F-4Es had serial numbers 77-1743 to 77-1760 and two other aircraft 74-1618 and 74-1619, which had originally been ordered to cover two losses that had already taken place. The RF-4E were 70357, 70358, and 71761 to 71766. 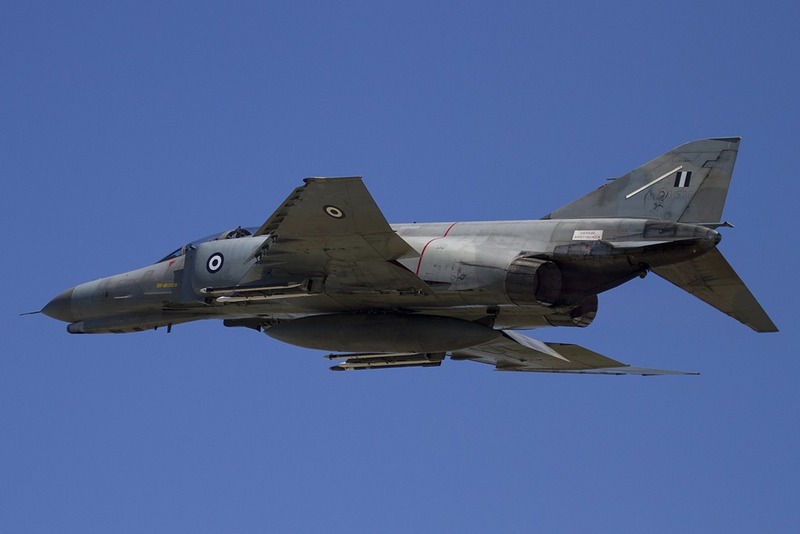 All HAF F-4E Phantoms were delivered to Greece in South East Asia color scheme (SEA, the “Vietnam” camouflage) with large light blue HAF roundels. Later many of them received an overall dark blue camouflage, named “Aegean Blue”. In the late 1990s, the current scheme dubbed “Aegean Ghost” started to be applied to the Greek Phantoms. The process was not completed for all of them, because the retirement of the aircraft had already begun. In July 1990 the US government offered 28 F-4E from the Indiana Air National Guard under the South-eastern Regional Agreement (SRA). As part of the deal, the US could continue operating of its own air bases in Greece for another 8 years. The first 9 aircraft came from the 131st Squadron of Missouri ANG, and arrived at Andravida on 3 August 1991. 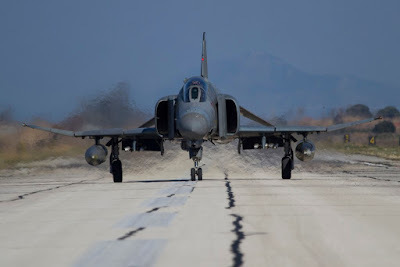 Upon their introduction, it was 338 Squadron that received all former USAF aircraft, while all existing Greek F-4s were allocated between 337 and 339 Squadron. - 68-0318, 0361,0363, 0381, 0393, 0394, 0402, 0405, 0408, 0412, 0424, 0426, 0432, 0438, 0440, 0442, 0444, 0445, 0480, 0481, 0496, 0506, 0515, 0517. The SRA F-4E aircraft were retired on 16 December 2005, when 337 Squadron temporarily ceased operations withdrawing all 28 of them in preparation for the arrival of the F-16C/D Block 52+ before resuming its role as lead interception unit of the northern Aegean. Two years later 348 Squadron’s recce fleet was reinforced with 27 RF-4Es from the German Luftwaffe. 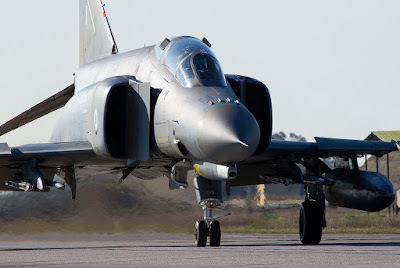 Under NATO treaty, Germany granted a large number of RF-4E to Greece and Turkey which were being phased out of Luftwaffe service. The 27 aircraft for Greece started to arrive in the spring of 1993. Only 20 were taken into service and added to the 348 Squadron’s remaining 5 RF-4E (three had been lost in accidents), allowing the remainder of ageing RF-84F Thunderflashes to be finally retired. The rest of the German aircraft were used as spare parts source. The former Luftwaffe RF-4s had the “Lizard” paint scheme. Later some received a different kind of “Lizard” paintjob and some were repainted in SEA scheme. HAF finally retired its three remaining RF-4Es on May 5, 2017. It is worth mentioning that the HAF came twice very close to other agreements to obtain extra Phantoms. The first time was in 1987, when the US offered withdrawn F-4Ds, and the second occasion was when Great Britain was retiring its Phantom FGR Mk 2 (F-4M). Both offers were declined as it was too expensive to maintain so many different versions. After 23 years of defending the Aegean Sea, the HAF decided to upgrade the F-4E Phantom II. In the early 1990s a search began for an upgrade program. The aircraft was still a capable weapon and procuring new fighters to defend the Aegean would have been too costly. When the Greek government approved funding for the upgrade program, two candidates, the German DASA and the American Rockwell offered their proposals. DASA had already upgraded the German F-4F, while Rockwell had the knowledge and the know-how from the manufacturer, McDonnell Douglas which it had recently acquired. The upgrade program was mainly a life extension of the fuselage and an avionics upgrade which focused on replacing its electronic equipment and radar, centred on the BVR capability and acquiring modern missiles like the AIM-120 AMRAAM. The number of the aircraft to be upgraded was 39, consisting of 29 Ρeace Ιcarus Ι and 10 Ρeace Ιcarus ΙΙ airframes. DASA (later EADS) won the contract, mainly thanks to its existing upgrade program of the F-4F. The contract, under the name Peace Icarus 2000, was signed on 11 August 1997, with deliveries planned to be completed by the end of 2000. The main systems supplier was the Israeli company Elbit, which had gained experience with its own upgrade program of the Israeli Phantoms. Only one aircraft went to Germany to be used as a testbed for this upgrade program. This aircraft was 72-1523 and it was nicknamed ‘Princess of Andravida’. The prototype first flew on 28 April 1999 and the test program took place at the facilities of DASA in Manching, near Munich, Germany. The Service Life Extension Program (SLEP) was carried out by Hellenic Aerospace Industry, which also upgraded the avionics on the other 38 aircraft. One of the greatest tactical disadvantages of the Phantom was its smoky engines. The visibility of the smoke trail was greatly reduced by modification of the J79-GE-17A to -17C standard, replacing the ten combustion chambers with newer ones. Some of the Peace Icarus 2000 Phantoms received existing -17C engines taken from the retired SRA F-4E Phantoms. After 154 test flights and some fifteen months of trials, 72-1523 returned to Greece, where it continued carrying out some more weapon trials. After two years of long delays the first upgraded aircraft were ready by the end of 2002. On December 18th, 2002, the delivery ceremony of the first upgraded aircraft by Hellenic Aviation Industry was held at its facilities at Tanagra. At the end of the deliveries, the total number of the upgraded aircraft was 36, due to three losses from accidents before its completion. The F-4E AUP (Avionics Upgrade Program) Phantoms were all delivered to 117 Combat Wing at Andravida, all painted in the ‘Aegean Ghost’ scheme. With this upgrade the second generation fighter had become a very capable multi role fighter, which could oppose even third generation enemy aircraft. This new IFF system is the most disguisable feature of the Ρeace Ιcarus 2000 Phantoms with its four “bird slicers” antennas on the nose. Concerning its weaponry, the AIM-120 AMRAAM BVR missile replaced the original AIM-7 Sparrow. The aircraft can carry up to four AIM-120 AMRAAMs under its belly while other modern weapons like dispenser missile AFDS, AGM-65A/B/G missiles, precision guided bombs such as the GBU-10/24 Paveway II/III, Mk 20 Rockeye II or other free fall bombs can be carried under its wing pylons. The weapons system officer’s (WSO) role evolved to match the multi-mode capabilities of the APG-65 radar. The use of the Litening pod is the WSO’s main responsibility. An experienced WSO serves as the ‘brains’ of the tactical formation, providing regular situational awareness updates to the other crews to increase the probability of a kill in air-to-air missions or provide accurate attack parameters for air-to-ground missions. With the Litening II pod, the F-4E can also undertake non-traditional intelligence, surveillance and reconnaissance (NTISR) duties or designate targets for other aircraft carrying precision guided munitions. Both Squadrons of the 117 Combat Wing had a dual tactical role of Ground Attack and Interception, but their main roles were Ground Attack for 338 Squadron and Interception for 339 Squadron. The 338 Squadron was formed on 24 December 1952, at Elefsis AB, as 338 Fighter Bomber Squadron equipped with the F-84G Thunderjet. In May 1958 it was incorporated into the 115 CW at Souda AB until January 1960, when it was disbanded. It was reformed in August 1964 equipped with F-84F Thunderstreak. When the F-4E Phantom II was delivered, 338 Squadron was reassigned to the 117CW at Andravida in June 1974. In August 1991 the squadron’s aircraft were replaced by the F-4Es received under the South-eastern Regional Agreement (SRA). The emblem of the squadron took its present form in 1974. The God has been “modernized” compared to the earlier emblem; instead of a spear, he is holding a 2000 lb bomb. In the background there is the internationally recognized Spooky mascot of the F-4 Phantom. The inscription «H TAN H ΕΠΙ TAΣ» is the phrase Spartan mothers used to say to their sons as they handed over their shield for battle: «Return with the shield or (be carried) upon it». The 339 All Weather Interceptor Squadron formed on 7 July 1952 also based at Elefsis AB. It was initially a Fighter Bomber Squadron and was also equipped with the F-84G Thunderjet. After being redeployed to several other bases across Greece, in March 1971 it was finally assigned to the 117 Combat Wing at Andravida. In April 1974 delivery of the F-4E Phantom II aircraft started re-equipping 339 Squadron. It received the first Peace Icarus 2000 upgraded aircraft in 2002 with the final delivery in October 2005. 339 Sq was disbanded indefinitely last October, leaving the other Squadron as the sole operator of the legendary Phantom. An official ceremony was held at Andravida air base on October 31 for the disbandment of 339 ‘Aias’ Mira. For the occasion, one aircraft, serial 71744 was partly painted to mark the disbandment, with different artworks on each side of the tail highlighting 65 years of operations by ‘Aias’. Though 71744 is due for overhaul, it is expected to return to operational service with 338 Mira, and will likely retain these 339 Mira markings. Three F-4E (AUP) aircraft from 339 Mira flew during the ceremony, performing some flybys. The standing down of the ‘nine-ers’ also marked the expansion of its sister unit. The personnel and aircraft of 339 Mira merged with 338 ‘Ares’ Mira on October 31. The unit will have approximately 25 operational Phantoms in its inventory. There are currently no plans to reduce the number of active aircraft in service. The introduction of the F-4 in the Hellenic Air Force inventory in 1974 marked the beginning of a new era for the Hellenic Air Force. The new jet not only incorporated technological advances but also contributed to a major development in tactical air operations. At that time, Phantom was the most modern aircraft in the HAF, battle-proven in US service in South-East Asia. With a crew of two, twin engines, good performance, large payload, BVR missiles, day and night, and capable of multiple roles, the Phantom presented a big leap for the HAF. 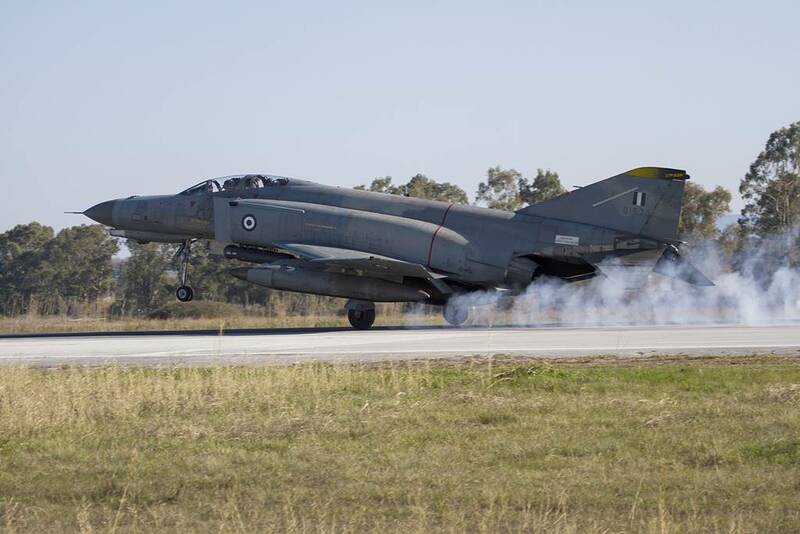 Today, Greece’s financial problems have impacted the military, but the Phantom maintains its role in the defence of Greek territory. The aircraft was synonymous with the old saying ‘drink, smoke and make noise’. Yet this jet is still capable of fighting against modern opponents.